In my previous article I wrote about installing Metro and Glassfish. That article is the prelude for this one. Developing webservices using a toolstack like Metro (as alternative for Apache Axis for example) opposed to developing them in your Application Servers native technology gives you more flexibility in choosing your deployment target. You may rightfully respond with stating that Metro is the native technology of Sun's Glassfish Application Server. It is in fact part of it. But Metro is also available as a separate library for other Application Servers or even standalone clients. The basics of developing a webservice using Metro in Eclipse is written at: https://metro.dev.java.net/guide/Developing_with_Eclipse.html. When having your workspace on a network share, define a drive-letter for it or a mount point (for example: /home/makker/workspace) and don’t use the windows-network-path reference (\\networkhost\Share$\makker). Otherwise deployment may fail because of ‘file not found errors’. 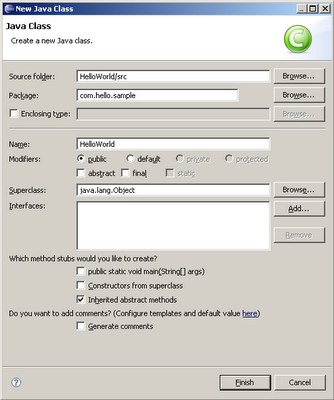 A HelloWorld webservice using Metro in Eclipse is really simple. It’s all about the WebService annotation really. 7. 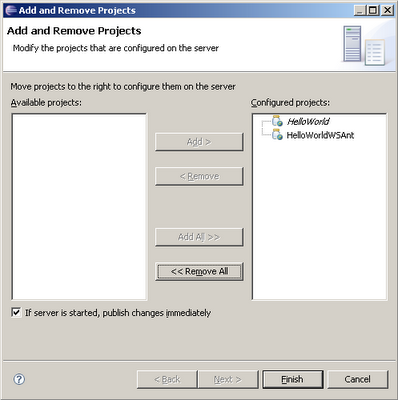 Go to your GlassFish server in the Servers tab and right click -> ‘Add and Remove Projects’. Shuttle your HelloWorld project to the right. 8. Click Finish. The project will be synchronized with the server automatically. If you do a change then with Right Click>Publish you can synchronize again. 10. This can be tested with SoapUI. The same project can be created using ANT. This is especially usefull when the source may change during development. And when deploying to a another AS then Glassfish. To generate the necessary webservice code from java-source (bottom-up), APT (Annotation Processor Tool) is used. For Apt an Ant task exist. For starting your project from WSDL (top-down) also API's and corresponding Ant taks are available. With Metro samples are delivered to show how to do that. Again create a Dynamic Web Project, like above. The scripts expect JAVA_HOME and METRO_HOME to be set. This time I changed the name and the service name to distinguish from the former example. The ant script also places a web.xml, and a sun-jaxws.xml into the WebContent/WEB_INF folder. It expects these files in the /etc/deployment folder. Copyright 1997-2007 Sun Microsystems, Inc. All rights reserved. language governing permissions and limitations under the License. file and include the License file at glassfish/bootstrap/legal/LICENSE.txt. It’s in fact the deployment file for Metro. For deployment on Glassfish this is enough. Apparently deploying to Glassfish from Eclipse would not need this file. 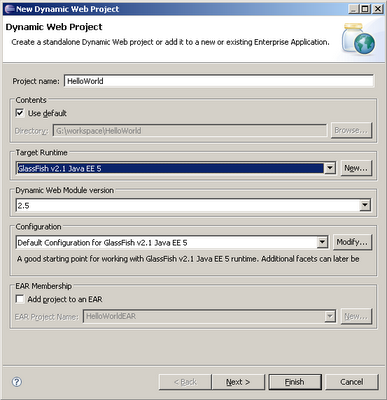 This Web-deployment file is generated when deploying to Glassfish from Eclipse. So don’t use this file in the WEB_INF folder in the Glassfish case. The web.xml will then be generated. The generated web.xml file will point to a JAXWSServlet class in the Glassfish application server. Other application servers will also have an own version of this class. In the above web.xml a specific Metro Servlet listener is initiated. Also the webservice will point to a Metro servlet implementation. Than on run-time Metro will generate the webservice and service it. For deployment to Weblogic 10.3 you need to install one of course, and create a domain. On some Application servers using the Sun 1.6.0 JDK, the webservices-api.jar should be set in the *jdk_home*/lib/endorsed. On my local Weblogic 10.3 server I did not need to. After this you have to restart your domain. 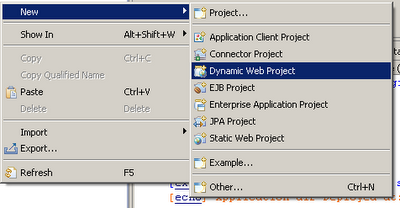 You can add Weblogic to Eclipse the same way as Glassfish. You’ll have to install the Weblogic pluging though. Choose the ones from the Oracle main entry (not the BEA), because Weblogic 10.3 is from the Oracle BEA era. You cannot deploy your project by publishing it from Eclipse. 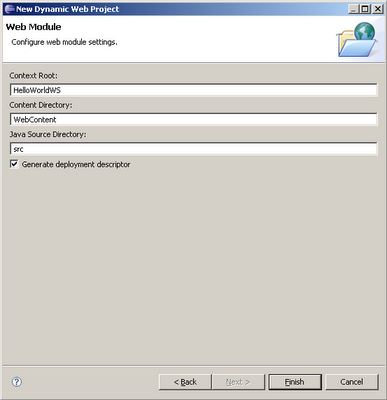 Eclipse will complain that Weblogic will not support the sun-jaxws.xml deployment descriptor. In your HelloWorld project, make sure you have your java source, web.xml and sun-jaxws.xml compiled and in the right folders. Then export your project to a WAR file. This War file can be deployed to Weblogic using the console (localhost:7001/console). In the console click on Deployments and then install or update. Upload the war to *weblogic-domain-home*\servers\AdminServer\upload\ . If you point directly to your war-file, it is locked by Weblogic. I did not try it yet, but it might be possible to register the generated wsdl as a post-deploy step in WebLogic. Maybe that this enables the console to better manage the webservice application. Earlier I mentioned that it's all in the Annotation really. In the above example I used the bottom-up approach (in the Metro-samples called the "from-java" approach). The HelloWorld example just receives a string and responses with one. But in reqular projects you want to return more sophisticated structures. And then you might want to do the top-down approach, starting with WSDL. The side affect there is that if you change the WSDL you generate the java-implementations, but you have to manually recouple those with your functional code. I did the from-java approach so I create a compilable set of my functional and webservice code. And then I generate the webservice (XSD and WSDL). This is very usefull if you're in control of the interface. But then you need an enhanced set of annotations to refine your interface. With this set I managed to manipulate the outcome of my WSDL and XSD generation to match the design. The full description of the annotation you can find at file:///*metro-home*/docs/annotations.html or in the Latest Online Doc: https://jax-ws.dev.java.net/nonav/2.1.7/docs/annotations.html. This is, I think, the basic annotation. This makes the webservice. Actually you need only this one to turn a class into a webservice. This one just denotes which methods are to be exposed as Webservice Operations. Name of the result variable, the root element in the response message in the XSD. These I found are very usefull. With these you can influence the name of the request and response messages, theire namespace and the name of the generated request and response classes. Mark that for these two the webservices-api.jar has to be added to your project. You might have the GlassFish 2.1 Java EE 5 system library added but this does not have the webservices-api.jar added to it. The corresponding classes for these two annotations are there. For the other annotations you have to do the corresponding imports from javax.jws.*. With Metro it is really easy to generate an Application Server independend Webservice. With the annotations it is also possible to influence the outcome of the XSD and WSDL generation. For a new customer I'm looking at using Sun's Metro. Metro is in fact a SOAP toolstack similar to Apache's Axis. We want to develop webservices that are independent to the application server it has to run. In the end it has to run on Websphere, but this is not what we have on our development PC's. So I created a simple HelloWorld webservice, that I deployed to a Glassfish server. Getting it to work on Glassfish should not be too hard, since it is delivered with Metro (both products of Sun), although I upgraded it. But having it working I tried to get it to work in Weblogic. I may assume that having it working on Weblogic it should also be deployable to Websphere. In this article I'll summarize my steps on installing Metro and Glassfish. In a follow-up, I'll expand on creating a HelloWorld webservice to deploy on Glassfish and Weblogic. I'll assume that installing Weblogic is straightforward and doable by anyone that can download the installer from otn.oracle.com. The recommended or required setup for developing webservices using Metro and Eclipse can be found on: https://metro.dev.java.net/guide/Required_Software.html. Glassfish for J2EE Webservice deployment. Used Version 2.1.1, latest production. It appears that the default minimal heapspace is not enough. Following the user-guide a minimum of 256M should be used. The command above just unpacks the installation to a subdirectory called ‘glassfish’.. The actual setup is done using ant. Perform the setup using ant. The ant delivered with Glassfish is 1.7.1. You could use this one. But if you have the same already installed elsewhere on your system you could ofcourse use that. Using port 8080 for HTTP Instance. Using port 7676 for JMS. Using port 3700 for IIOP. Using port 8181 for HTTP_SSL. The Login information is stored in seperate file on the user’s home directory. Default username for the admin user is: ‘admin’, the password is: ‘adminadmin’. Installing metro goes about the same. Metro is included in Glassfish. But the used Glassfish is from January 23rd 2009 and Metro April 17th 2009. So I suggest updating Metro to be sure we have the latest version. If needed (and not already done) set your proxy-Server, to get plug-ins downloaded. Go to Window > Preferences > General > Network Connections. Determine your proxy-server. For example, get it from your browser connection-settings. Set the Proxy. Normally use the same proxy for all protocols. Choose the appropriate Glassfish version (Glassfish Java EE 5 Server), accepteer license, etc.and follow the further next-next-finish pages. In the Server Tab, Right-Click > New Server again. Follow the wizard to the end and press finish. You can now start and stop The Glassfish using the Eclipse icons and/or menu items. I find it convenient to have Application Servers Admin consoles started in an external browser (Firefox) when opened from Eclipse. To have that, choose Window>Web Browser> 2. Firefox (depending on given choices and possible browsers install sequence). Where asadmin is in the *glassfish-home*/bin, for example: c:\utils\glassfish\bin. On Windows, when I (re-)configure PC for friends and family, I install AVG Antivir for them. It's free, and I've pretty good experiences with it. That is: it runs and updates quite smoothly. For Linux I've found that they're one of the few with a free product for linux. There's also Clam, but I've not tried that one. You can download the Antivir product from their site. But I've found that installing it from Yast2 is more convenient, installing also menu-items and so on. If you check antivir-avguard, the others are checked as well. Make sure that Yast2 also suggest to install the Dazuko packages as well (it will if you check antivir-avguard). After installation, there are two things left to do. The updater complaints of an expired key. So following this post, you have to download a new license file from here. Then the updater should work.